Fuji Releases Underwater Housing Unit for the FinePix F10 Zoom | OhGizmo! By David Ponce on 06/14/05 • Leave a comment! Owners of Fuji’s F10 Zoom should be happy about this. 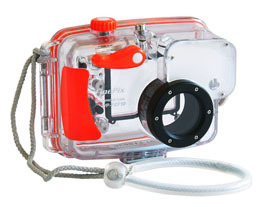 It’s a hermetic polycarbonate housing with which you’ll be able to take your camera underwater, up to 40 meters, and still retain full functionality. That’s right, even the zoom works and you have access to all the controls. It’s not the first such underwater gadget casing, what with the WaveCase, letting you take your cell underwater to take pics, and such. Well, why take the cell when you can take the real thing, right? The press release doesn’t mention price. You can get more details here. Story VIA Gizmonews.